Authentic coffee reviews and guides, by coffee lovers. Descaling is the process in which you try to remove every mineral built in your Keurig, normally limescale. This limescale is common debris in brewers, and it is most easily formed when the tap water you use to brew drinks includes a high level of minerals. Fortunately the process of how to descale a Keurig is quite easy. It appears as a hard white substance building up in coffee makers. This buildup, after certain period of time, will be likely to clog lines or become broken in small pieces, causing the improper operation of the feeding line fail and water reservoir in the Keurig. This means the coffee will start losing its taste, too. Some owners say that they don’t clean brewers before descaling and the descaling result is still fine. Actually, cleaning is not compulsory when it comes to descaling, but it is recommended as it helps to eliminate as much buildup as possible throughout the entire machine. And now, everything is ready for you to brew a fresh cup of coffee with your clean Keurig! 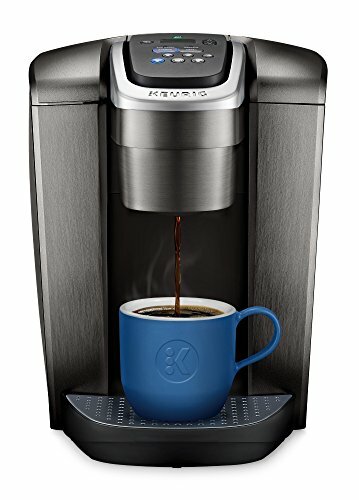 What Keurig Descaling Solution to use? While we suggest using citric acid as a descaling solution. If you want, you can try checking some other descaling solutions introduced by Keurig. And below are some things you need to be clear when it comes to choosing a solution. But in case citric acid solution doesn’t work for you, you can try vinegar(though I don’t recommend it. Keurig descale light stays on? What if you clear the Keurig, clean it up, but the descale light still stays on? So what next? Usually a couple of slaps does the trick. This is a very unlikely solution but it works! How to keep your Keurig clean? Cleaning and descaling Keurig is easy but it would be better if we can minimize the time to do this while our machine stays clean. I mean it would be much better if we can keep our machine clean without much cleaning and descaling. And below are some tips. Never allow water to in water reservoir longer than 7 days, or you are unintentionally building up deposits in the machine and as a result, it will take you longer time to clean and descale when you want to use the machine again. More seriously, this bad habit can contribute to building mold in your coffee maker which can cause sickness. It is recommended using distilled water to make coffee as it can minimize the mineral built up, however, it is not healthy enough. Or you can invest in a simple water filtration pitcher to remove annoying chemicals and tastes out of tap water. By this way, not only can you make better tasting coffee but you also minimize the built-up mineral. Remember to make a brewing cycle with hot water once after you have made sticky drinks hot chocolate or sugar cookie coffee. This brewing cycle functions as a cleansing brew, so do not add any K-cup in the K-cup holder. The reason why sticky drinks are noted here is that sugar leaves much unwanted debris in the machine than minerals do. And you might make condition for the unwanted pests to visit your Keurig if you leave it with a sweet sugary mess. Above is the must-be-known knowledge when it comes to descaling a Keurig coffee maker. Once you follow it with care, cleaning and descaling Keurig will become much more simple and effective than ever. Are you ready to start now? Sometimes, if the scale buildup gets too high your Keurig machine will throw an error and show you a message “descale.” But when you try the descaling process, it won’t brew – so what do you do then? The first thing you should try is to clean the exit needle. The exit needle is located in the bottom of the K-Cup holder. If the exit needle is clogged, then the machine won’t be able to start. To clean the exit needle, insert a paper clip or a needle and work it around to loosen the debris and pick it out. You won’t be able to poke the needle through since the open is not on the bottom, it is on the side. This should solve the descale issue on your Keurig. However, if you’re still running into issues, you can remove the water tank and check that there are no blockages in the connection between the tank and the pipes that go into the machine. Any blockages here will also have to be cleared. If that still doesn’t do the trick, then you’ll have to contact Keurig support. They’re very good and will help you out. My name is Rick, and I am a coffee addict. A D D I C T. I absolutely need my cuppa joe, and if you’re here, I’m sure you know the feeling. I used to drink boring filter coffees, but ever since I tried espresso, I have never gone back. I either need a french press or a steam-pressured espresso. I’ve done a lot of research in finding out which espresso machine to get, and I wanted to share all of my research with you guys so you wouldn’t have to spend as much time researching(and losing out on potential coffee drinking time) than me.